Rena Dourou, Governor of the Region of Attica, participated in the conference ‘Environment and development in the Mediterranean yesterday, today and tomorrow”, organised during Plan Bleu’s 40th anniversary on 5 June 2018 in Paris, where she spoke on behalf of the CPMR and its Intermediterranean Commission (IMC). 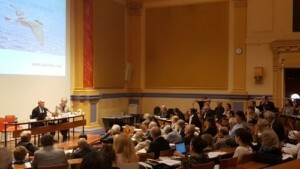 Plan Bleu’s 40th anniversary brought together over 130 people – including experts, decision-makers, representatives of national, European and Mediterranean institutions, and members of civil society. They discussed the future of the Mediterranean from an environmental perspective. The morning session focused on the creation process of Plan Bleu, Regional Activity Centre of UN Environment / Mediterranean Action Plan (MAP), and the way it has been influencing actions and decisions to address environmental challenges over the past 40 years. Then, participants discussed the main challenges the Mediterranean is and will be facing in the coming years, and how to tackle them. The Mediterranean has a unique cultural heritage and an exceptional biodiversity, but it is also very fragile and sensitive to climate change, especially its coastal zones, that are subject to numerous pressures. Coastal urbanisation, mass tourism, fresh water overexploitation and salinisation, pollution and marine litter, overfishing, development of maritime traffic and invasive species were identified as the main common concerns that call for joint stakeholders’ mobilisation. This fragile environment also represents a series of opportunities on such issues as marine ecosystems management, sustainable tourism, rural development, blue economy and biodiversity protection. This was the backbone of Governor Dourou’s speech at the end of the session “Prospective view: Is a shared vision in the Mediterranean still possible?”, who stressed the action of the CPMR and her Region towards an integrated sustainable development of the Mediterranean Region. She stated that “one of the major challenges of cooperation is always to act locally -in each Region- while being able to think globally. Consequently, the future of our basin must pass through a shared vision involving all key players at public and private level”. 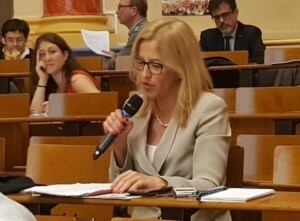 “Regional authorities play a significant role in terms of sustainable development and environmental protection, in coordination with municipalities and the civil society”, she added. She also highlighted several key initiatives supported by the IMC and her Region, in particular the “Bologna Charter” for the sustainable development of coastal areas and its Joint Action Plan tackling adaptation to climate change and erosion in the Mediterranean. These were adopted by 28 administration/territorial bodies, including many Mediterranean regions. She finally offered to keep working closely with Plan Bleu and other key stakeholders to promote a shared vision in the Mediterranean and joint actions in the field of in the field of sustainable development and environmental protection. 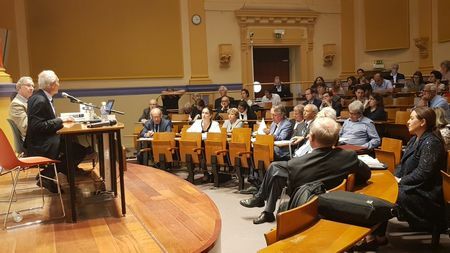 During the conference, Plan Bleu also announced the launch of MED 2050, a study looking at the horizon 2050 “intended to mobilise Southern and Northern decision-makers and stakeholders by overstepping geographic and institutional boundaries”, expected to be released in 2022.